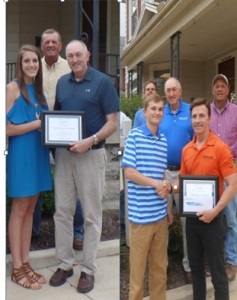 Mote & Associates, Inc., Engineers and Land Surveyors of Greenville, is pleased to announce their 2017-2018 scholarship award winners. The firm established a scholarship in October of 2002 at a celebration to honor the founder of the firm, Richard Mote, for his 30 years of dedicated leadership and his passion for engineering and surveying. Commendable students seeking a post high school education in the field of engineering, surveying, architecture, or a closely related field of study are eligible to apply for the scholarship. College students currently pursuing a degree in the aforementioned fields are eligible to apply along with high school seniors. Two $1,000 scholarships were awarded this year. Receiving the Mote & Associates’ Scholarships for the 2017-2018 academic year at the office of Mote & Associates, Inc., 214 West Fourth Street, Greenville, Ohio were Jacob Subler, a 2018 graduate of Greenville High School who is heading off for his first year of college to study mapping and surveying at Cincinnati State, and Danielle Winner, a 2018 graduate of Versailles High School who will be pursuing an architectural engineering degree at the University of Cincinnati. We would like to thank all of the applicants for taking the time to complete an application and we wish them all the best of luck! For more information regarding the Mote & Associates Scholarship, please contact the firm at 937-548-7511 or through our website at www.moteassociates.com.